Sport has brought people together since the birth of the human race. We have always used sport to compete, communicate and get to know one another. And this is why sport can be one of the most effective ice breaker games. As with all ice breaker games, sport helps people relax around each other and unite as a group. Sport has a number of benefits – improves fitness, encourages fair play and team work. This is why making a group of people who are meeting for the first time participate in a sport can have an incredible effect on the group. You will immediately witness members of the group working together, helping each other and providing one another with support. This can help people connect as they immediately understand each others' qualities. Sport can also show an individual’s weaknesses, which in fact works as a positive as people around the individual will notice these weaknesses and provide support to encourage and minimise the effect of their weaknesses – again showing a united front and teamwork. Football (soccer) – Football is a great team sport and requires a great deal of team work and communication. Communication is an essential part of the game. You need to communicate your position, when you're about to run forward and provide each other with verbal confidence and support. Praise is often heard on the football pitch and often strengthens relationships and helps start new ones. Football requires thinking about your team as a whole, not just individually. The key to winning is working well as a unit and this is great for the team to break down barriers and support one another to reach a goal – which is to win the match. 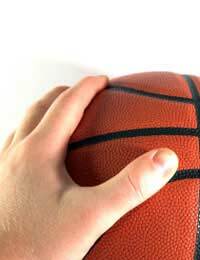 Basketball – This fast paced team sport is great for immediately breaking down barriers and getting people talking. As basketball involves a much smaller area than football and other outdoor sports, teams communicate constantly throughout the game. The quick playing style of basketball requires the group to establish a strong working relationship right from the start. Rugby – A physical sport like rugby can really help erase the nerves of a first meeting and encourage individuals to interact with one another. As an ice breaker, full contact rugby might be a little too aggressive, so why not play a game of touch rugby. This would eliminate hard tackles and yet keep the physical contact that can work so well for a group of people meeting for the first or second time. Again, rugby involves a strong element of team work and support. Defending team mates who have the ball is an important part of the game. This encourages trust amongst the group, which is one of the key barriers with new groups.